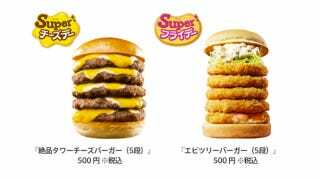 As part of its fortieth anniversary, Japanese burger chain Lotteria is rolling out two burger towers: one is a cheeseburger tower, and the other a fried shrimp burger. Where the hell are the puns, you ask. The name of the cheeseburger is actually "Super Cheese Day" (スーパー・チーズデー), which sounds like "Super Tuesday" (スーパー・チューズデー) in Japanese. The burger will be offered on October 16 and 23 only. Those days are, you guessed it, Tuesdays! According to Excite News, the Super Cheese Day is between three to five stacked cheeseburger patties. You, the customer, can pick how many patties, and it doesn't change the ¥500 price tag. That many burgers would typically cost between ¥860～¥1,360. The other burger, the fried shrimp one, is called Super Fryday (スーパー・フライデー), which is a pun on "Super Friday" (スーパー・フライデー). Same dealio on the number of patties and same price. It'll be available on October 19 and October 26, which are both, well, Fridays. So, if you live in Japan and like ridiculously large food, October will be a super month.